My Legacy file has 777 people born on Jul 10th. The first one I am going to write about is Susan Maria Abbott. She is my 6th cousin 6 times removed. Susan Maria Abbott was the daughter of Josiah Abbott and Ruth Estabrook and she was born 10 Jul 1820. She married Benjamin C Schneider on 25 May 1858. That was all the info I had and the only source I had for this was Descendants of George Abbott of Rowley, Mass., Vol 1. 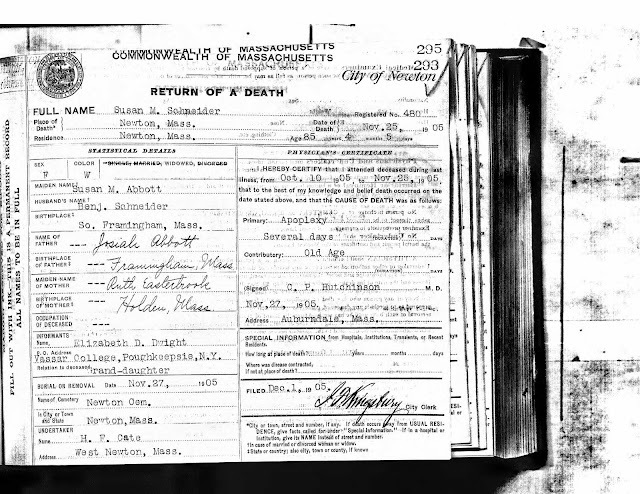 I was able add a vital record source for her birth, marriage and death and I found an entry with a photo at Findagrave. She was born in Massachusetts. She died 25 Nov 1905 in Massachusetts. I also found her in the 1850 US census. I also found her living with her parents in the 1855 Massachusetts census. The record I was most pleased to see was a copy of her will.